I found a variety of cat stories that sparked my interest this week! You may have seen some of them before — but I bet you haven’t seen all of them! Here’s an article that looks into the “crazy cat lady” stereotype — and why it is all wrong! While everybody else was celebrating St. Patrick’s Day, we smarter kitties were honoring our own patron saint, St. Gertrude. Many cat bloggers wrote about Pet Poison Prevention Week, but my own favorite was the post at Kitty Cat Chronicles because it actually listed a variety of toxic plants, plants that are deadly to cats — and plants that are safe for cats! While it’s not comprehensive, it’s enough to help you in a floral or plant store. 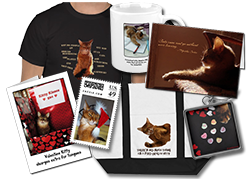 I also really enjoyed this post from The Swiss Cats about feline eyesight. As most of you know, this was my birthday week, and it was quite exciting for a lot of different reasons! I competed in a cat show in Portland, OR, and that was quite an adventure. An even bigger adventure was getting there — I flew! Find out all about that, and who I spent time with in Portland when I wasn’t in a judging ring. In fact, I had so many photos left over, I devoted a whole Wordless Wednesday post to pictures from my trip. Thursday was my birthday, and I celebrated by holding a commenthon for Southern California Abyssinian (and Somali) Rescue. Because so many of you stopped by to wish me a happy day, I made my goal well before midnight! Here are some lessons in cute for you kitties who need a refresher course! If you see a good cat-oriented news item around the internet, send me a link and I may include it next week! Wow, thank you for sharing our post about toxic plants and flowers! 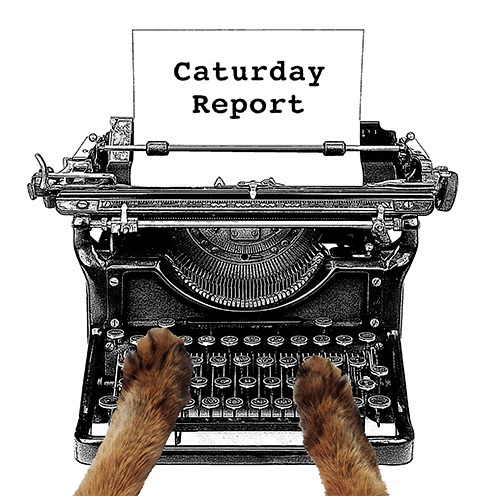 We are glad that you enjoyed it and felt that it was worth sharing in your Caturday report. We also enjoyed the article about the crazy cat lady stigma and why it’s wrong! That first article is so interesting and the man from Japan clearly is a hero, what a special human being he is…loved these two articles, thanks Summer! Thanks for sharing these great posts. Mum has been so busy that she missed most of them so it’s great to be able to catch up. As always a fantastic report of a busy week – how do you have the energy ??? How much do you nap!? And thanks for the message about the books – we know good things come to those who wait so there’s no big rush. We are eager to see it of course, but you have so much to do we understand. Thanks for the news round up, Summer. We’re off to catch up on some of the stories we missed. TW knew nothing about St. Gertrude when she gave Mean Mama Calico that name. The Japanese guy is a hero. Thanks for all you find and post. Some great articles we missed! Thanks for that Summer. That crazy cat lady thing has got to be crushed!! It was a great week! And yous my dear – shone!!! We didn’t know about St. Gertrude either. One can never have too many patron saints! Hi Summer! 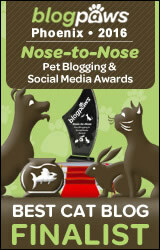 We hope you and your human and Binga & Bodie are having a good day! We read about the man in Japan that’s taking care of the animals. It’s so incredible of him to be doing this. What a sad situation. We read about the crazy cat lady stereotype too. Great articles! I missed a lot of posts this week. Mum didn’t help me visit as much as she should have. St, Gertrude – who knew? Great stuff. We really liked the first entry – men who love kittehs are pretty pawsome aren’t they? We really liked the feature on Naoto Matsumura. Amazing! I sure missed a lot! I need to read about St. Gertrude and the one trying to get rid of cat lady stereotypes. 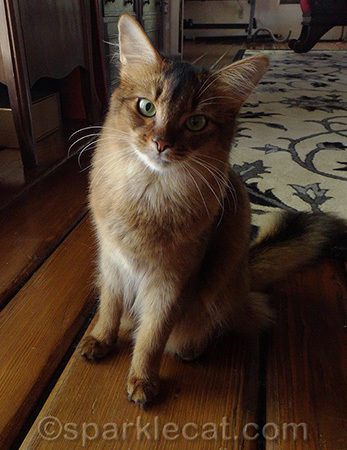 It’s a good thing you do the Caturday Report, because we missed the post about Portland! Thanks for the round up Summer! Our mommy may have a black thumb but when she does get plants she wants them to be safe! Concatulations on your commenthon! We’ll be sending our matching donation in this weekend! Great report Summer. I missed quite a bit this week. So nice to have you to catch us all up. Oh, I missed some good stuff this week. Have a fun Saturday pretty Summer! what great news! happy saturday! We made a quick trip over to chevk out Caturday news before Sis arrives! Thanks Summer! Those are great stories & good info! You make my life easier ! PS| Don’t work to hard, it’s Saturday ! Yous have so many cool write ups Summer, will takes me awhile to go through thems all!